The other day I was watching the spawn from hell delightful Caillou with my son. The topic of this particular episode was the importance of cleaning up after yourself. Caillou and his preschool pals were allowed to skip picking up their classroom for a few days and saw how quickly things got out of hand. An important lesson, no doubt. As I was watching the show, my heart sank as I looked across my living room. Blocks scattered in all parts of the room, crayons strewn across the coffee table, books opened on the floor. Caillou would not be pleased. What’s worse is that my toddler likes cleaning up. He doesn’t even need a special song to get the job done. He just needs to be told that it’s okay to put things away. Sadly, he probably thinks his toys are supposed to go all over the place. Some example I’ve set. The messiness goes beyond my son’s things. Clean laundry remains piled up and unfolded. My closet is stuffed with clothes I never wear. Mail sits on the desk unopened and unsorted. And every room could use a good vacuuming. I can’t blame my failure to be neat on motherhood. I was never into cleaning, and becoming a mom just gave me another reason to be messy. I suppose I could stop writing this and do something productive like organize my closet or fold some laundry. 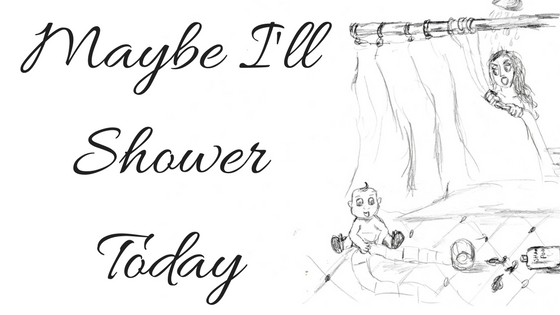 Maybe tomorrow. I’m busy getting judged by children’s shows. This entry was posted in Smile and tagged Caillou, cleaning, motherhood, neat-shaming, parenting fail on January 25, 2015 by Maybe I'll Shower Today.